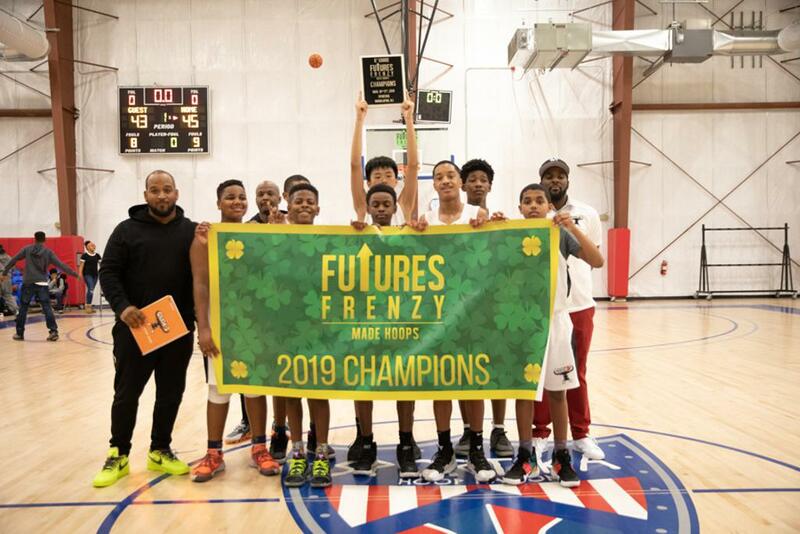 It was only right that the championship game of the seventh grade division at Futures Frenzy came down to a rematch between the New York Rens and Rising Stars Elite. In pool play they had a thriller that came down to the wire, and the same happened in the title game, with the Rens winning 57-50. Qadir Martin was the star for the Rens, scoring 19 points in the victory, while Taj Bryant scored 11 and Travis Upchurch scored 10. In a losing effort for the Rising Stars team, Jordan Howe scored 16 points while Jayden James scored 11. 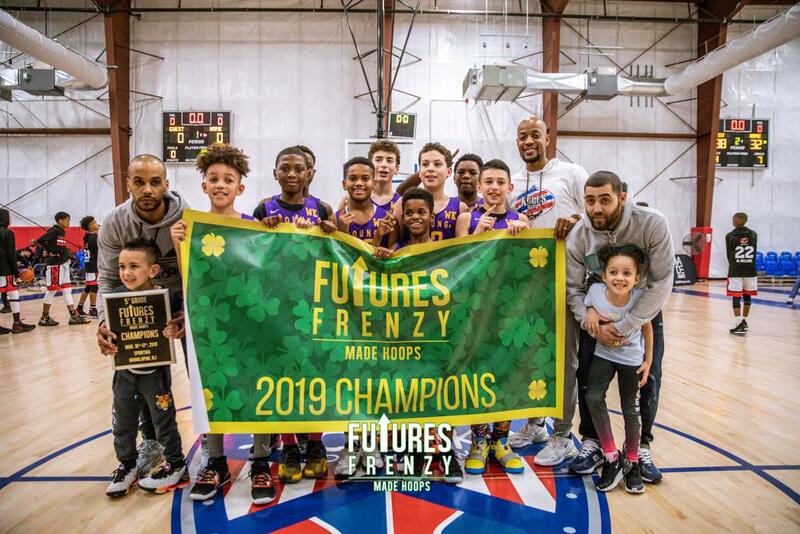 Qadir Martin, New York Rens: It was another excellent weekend for the talented forward, who at times was dominant for his Rens teams, leading them to a title in New Jersey. He battled bigger prospects and never backed down, showing his continual progression this winter. Amir Williams, Team Delaware: I was very impressed by the long 6'0"+ forward prospect, who is going to develop into a very talented player in the state of Delaware. He moves well for a player his size, and finishes plays consistently at the rim, while showing a hunger on the glass. 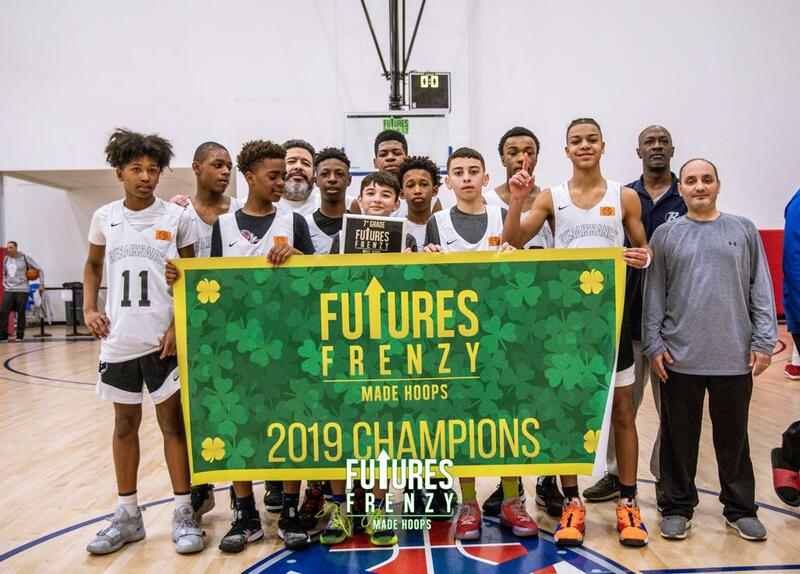 Dwayne Pierce, Rising Stars: The talented wing prospect was a key piece for his Rising Stars team that made it all the way to the championship game of the Futures Frenzy event. He has good size and is a talented scorer who can create problems anywhere on the floor with his skills. Jakai Sanders, Brooklyn Bridge: The big wing was a major problem for defenses throughout the event. His Brooklyn Bridge team was one of the toughest in the entire event, and he was their fearless leader on the floor, providing toughness and scoring throughout the weekend. Jack Bailey, Riverside Hawks: One of the better shooting guards in the division was the Riverside Hawk, who is becoming a more consistent offensive threat as his seventh grade year progresses. If you give him any space on the wing, he's going to make you pay on the perimeter. Tavian Pullock, New Jersey Playaz: We really like what the talented 6'2"+ forward can become in the future. Right now, he's an active athlete and rebounder on the glass who is just beginning to learn how to use his body to score baskets on the offensive end. Expect him to keep sprouting this year and take the next step. Lucas Mengual, City Outworks: A tough point guard prospect, he was the heart and soul of his Outworks team throughout the weekend, providing consistent scoring on offense and toughness on defense. As he continues to improve his perimeter shot, he'll become even more dangerous as a player. One of the stars of the entire event was Gauchos guard Olin Chamberlain Jr., who scored 13 points in the championship game to lead his team to a hard-fought 45-43 win over a surging Team Jacko squad. Markell Alston scored 11 points in the victory, while Jacob Wang scored eight points. For Team Jacko, Luke Bevilacqua scored nine points, while Jordan McKie scored eight points and Shareef Jackson scored six. It was the Gauchos who were victorious again in the Silver Championship game, as they took down the NJ Bulldogs 60-47. Trevon Lewis starred for the Gauchos all weekend, and he scored 17 points in the title game, while perimeter sniper Tai Turnage scored 17 points of his own. Brandon Stores scored 13 points while anchoring the paint in a winning effort. Jebron Harris was the star all tournament for the Bulldogs, and he scored 19 points in the title game. Olin Chamberlain Jr., Gauchos: The most polished guard prospect in the division was the 5'8" Pennsylvania native. He showed a high level of skill for a prospect so young, and he routinely got whatever he wanted for his team, all while leading them to a championship. Jebron Harris, NJ Bulldogs: The most dominant prospect in the division was the 6-foot wing, whose combination of size and skill made him impossible to stop at Futures Frenzy. The younger brother of two highly touted prospects, Jebron is doing a great job of following in their footsteps to this point. Shareef Jackson, Team Jacko: The improvement that we've seen from the 6'4" post has been staggering from December until now. He's highly skilled on the low block, and his ability to use his off-hand around the rim is very impressive for a player his age. His game is growing by the week. Brandon Benjamin, NJ Silverbacks: Another potential star prospect down the line is the agile and fluid 6-foot wing. Not only is he going to grow and become a lanky prospect, but his skill level right now for how big he is is quite impressive. Keep an eye on this New Jersey prospect. Israel Jackson, Black Ops: It's important to pay specific attention to this 6'1" evolving big man. There's no doubt that he's going to keep growing and stretching out, as evidenced by his huge feet and long arms. However, he's pretty agile and coordinated right now, showing ability to finish around the rim at a consistent clip. Trevon Lewis, Gauchos: It's been a consistent theme all winter long for the Gauchos. The 5'11" wing prospect has been a dominating player for his team, showing ability to get to the rim against anybody you put in front of him. On defense, he's also impressive when he's locked in. Warren Keel Jr., Team Spartans: One of the most impressive playmakers we saw all weekend regardless of division, was the Northeast native. He was a vocal leader for his team, and his ball skills and shifty play had the crowd mesmerized by his advanced skill level for a player so young. Julian Sustache, BABC Prep: The talented lefty had excellent vision on the floor, consistently finding open teammates for easy scores at Futures Frenzy. While he still has some work to do on his perimeter shot, his creation skills are advanced for his age group. Jabari Chichester, Family Over Fame: One of the most talented scorers in the division, he racked up high point totals for his team throughout the weekend. He's got an advanced level of skill that should translate well as he continues to grow and mature. 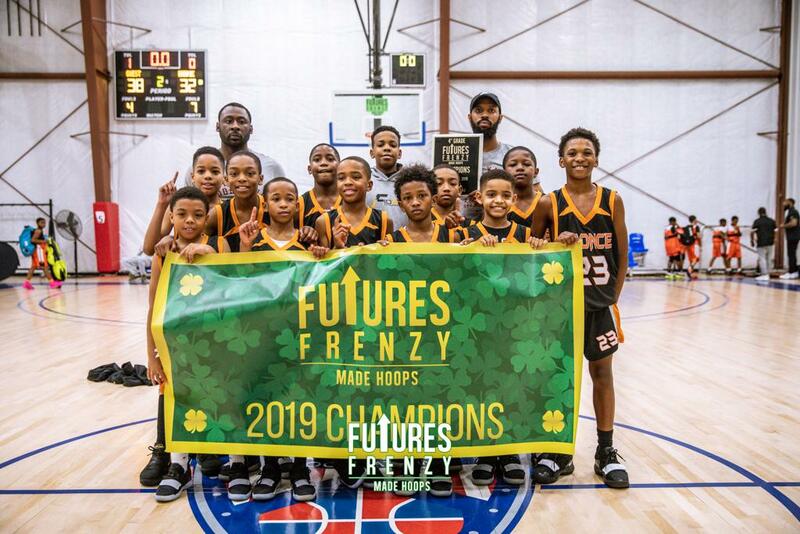 Ashton Walker, 757 Hurricanes: We really like the flashy style of play from the talented guard, who made the 757 Hurricanes a team to root for in New Jersey. He's a skilled perimeter threat who, when left alone, can score with the best of them from beyond the arc. He's also a talented slasher. Hasan Powell, Elm City Elite: A player with no shortage of heart and toughness, he was an integral piece for his Elm City Elite team throughout the event. He got tough baskets in crunch time, while also providing an avenue to create for his teammates. In one of the most heated games of the entire tournament, Young Bucks battled and took down League Bound Elite in the title game by a score of 48-41. The star of the division throughout the tournament was point guard Jermel Thomas, who has proven to be a dazzling young talent. He finished the title game with 10 points, while setting up teammates everywhere on the floor for easy baskets. Jett Schwartz led the Young Bucks with 16 points in the win. For League Bound Elite, Torrey Brooks Jr. had 10 points in the loss. Jermel Thomas, Young Bucks: At his age, his combination of ball-handling skills, passing skills & feel for the game are outstanding. He made head-turning play after head-turning play throughout the event, proving that he's a rising star in the 2026 class. Marvin Reed, League Bound Elite: Another dazzling playmaker in the division was the 5'0" point guard. He controlled the tempo for his team throughout the event, and kept pressure on defenses with his frenetic style of play, balancing scoring and distributing. Brooklyn Jelinsky, Ivy Lions: The 5'2" guard proved to be a reliable scorer throughout the event, and was a key cog for the Lions, who showed that they could play with any team in the division. His scoring savvy makes them one of the most dangerous teams in the country in that age division. Jackson Southerland, Riverside Hawks: A bigger guard prospect for that age at 5'4", he's a very diverse player who can do a variety of things on the floor. He knows how to score with ease, but he's also a flashy passer and an unselfish prospect who fits in well with other talented guards. Malik Hughes, Fidonce: A big man with a lot of upside in the future is the 5'8" Philadelphia prospect. He moves well for a player at that age, and is more fluid than most posts. He has nice hands and finishes plays consistently for his team. Bennett White, UPLAY: A bigger forward at 5'6", he was active throughout the tournament, providing a lengthy, versatile piece for a talented UPLAY team. As he continues to grow and improve his perimeter skills, he's going to become a very good player in Canada. 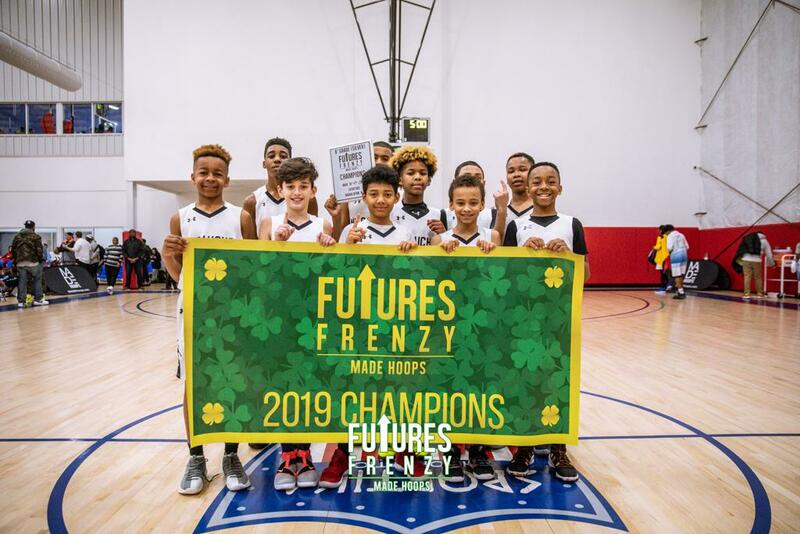 Fidonce upended a tough Team Takeover squad 38-32 in the 4th Grade Futures Frenzy Championship. Leading the way for Fidonce, like he did most of the tournament, was 5'7" wing Nasir Ralls, who finished the title game with 14 points. Yasir Turner chipped in with 12 points to help carry his team to victory, with Jett Harrison chipping in six points of his own. For Team Takeover, flashy point guard Jamaal McKnight Jr. led his team with 10 points, while Corey Collins Jr. finished with seven points in a losing effort. Jamaal McKnight Jr., Team Takeover: A flashy point guard at 5'0", he was a fearless leader for his team throughout the tournament, leading them to the championship game. He's best when playing at full speed, and he plays with fire on the floor. Xavier Butler, CP3 Academy: The 5'4" forward was one of the most dominant prospects in the 4th grade division, consistently getting tough buckets for his team. On a very balanced team, he stands out as a physical leader and scorer. Rasheed Muhammad, Team Takeover: Another high scorer in the division, the pint-sized guard is a fearless bucket-getter who ended up having a very nice tournament for Team Takeover. ©2019 MADE Hoops / SportsEngine. All Rights Reserved.